The Kushiro International Wetland Centre (KIWC) was awarded the Foreign Minister’s Commendation for FY 2015 on August 27, 2015. Foreign Minister’s Commendations are awarded annually to individuals and groups making outstanding achievements on the international stage. 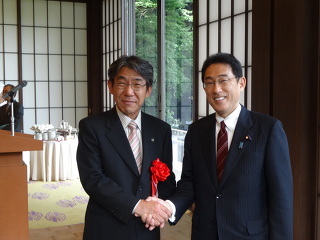 The accolade serves to acknowledge contributions to the promotion of friendship between Japan and other countries/areas. KIWC was established in January 1995 following the 5th Meeting of the Conference of the Contracting Parties to the Ramsar Convention (held in Kushiro in 1993) by Kushiro City, five other local municipalities with Ramsar sites, and related organizations. Since its establishment, KIWC has engaged in a variety of international cooperation activities in Japan and elsewhere to promote the conservation and wise use of wetlands. These include establishing sister-wetland affiliations, hosting trainees from abroad and providing information at meetings of the Conference of the Contracting Parties to the Ramsar Convention. KIWC is honored to have been recognized for its contribution to leveraging local natural resources and promoting friendship between Japan and other countries/areas, and its members have renewed their commitment to the variety of activities in which they are engaged. KIWC President Hiroya Ebina (Mayor of Kushiro City) attended an award ceremony on August 27 at the Foreign Ministry’s Iikura Guesthouse in Tokyo, where he was presented with a certificate of commendation by Foreign Minister Fumio Kishida. On July 12, 2015, a public participation survey on a restored river environment was conducted in the Kayanuma District of Shibecha Town, where the meander of the Kushiro River has been restored. This was the eleventh survey since 2010, and was attended by 30 people, including local residents and KIWC staff members. Participants were divided into three groups (a soil survey team, an aquatic organism survey team and a vegetation survey team) and carefully conducted their surveys under the guidance of experts. The soil survey team investigated riverside geological formations and river sandbank scale to gauge the status of sedimentation and flooding in the restored channel. The aquatic organism survey team observed fish in different habitats at survey locations. Through these observations, the team members realized the need to pay close attention to the future of signal crayfish (Pacifastacus leniusculus). Meanwhile, the vegetation survey team investigated vegetation, including changes in dominant species, in demarcated areas (known as quadrats) in the forest. After the survey, participants assembled at a nearby facility to look back on and summarize their surveys. They then compared their survey results with past data and discussed changes they found. Thanks to a newly completed boardwalk in the area where the meander of the Kushiro River was restored, the participants could easily walk to their survey locations. Although it was a scorching hot day, the event provided valuable opportunities to witness the works and impacts of the meandering river. This initiative was implemented with river improvement funding provided by the River Foundation. 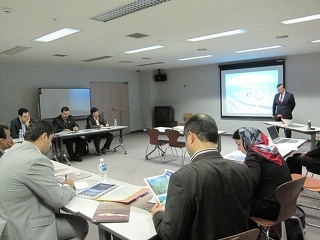 As part of an ecological management project (phase 2) organized by the Japan International Cooperation Agency (JICA) for Iran’s Anzali Wetland, training was provided in Kushiro, Japan, from October 13 to 17, 2014. The course was attended by administrative officials involved in wetland ecological management and sewage/waste treatment, and was run in collaboration with KIWC. 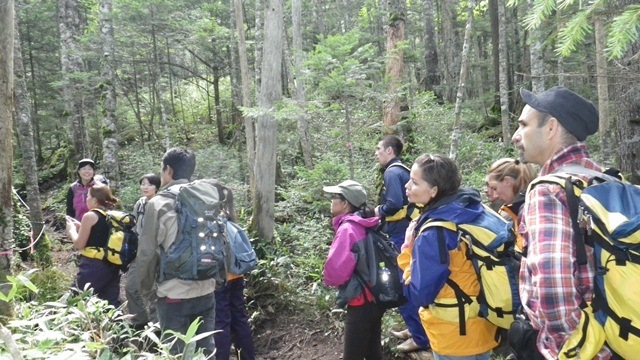 Nippon Koei Co., Ltd. was commissioned by JICA to implement the training program, on which the 12 attendees learned about ecological management in various parts of Japan from October 8 to 24. The trainees were divided into five groups (covering basin control, sewage control, waste treatment, ecotourism and environmental education, and wetland ecosystem management) to visit the Kushiro Wetland and neighboring local government facilities. 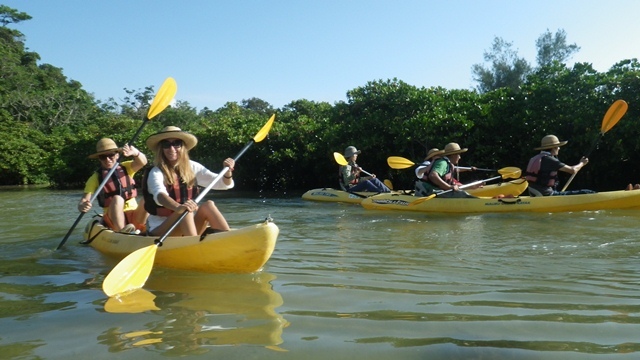 While there, the attendees learned about matters relating to their individual fields of specialization, including nature restoration projects, canoe tour operation in the wetland, and treatment methods for waste and drainage in the surrounding urban areas. KIWC hosted a lecture and an inspection tour of the wetland’s Toro district for all groups on October 14 to highlight matters relating to the conservation and utilization of the Kushiro Wetland. 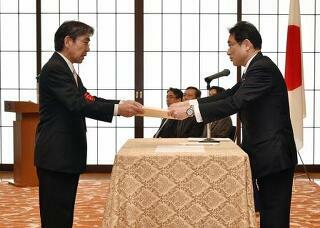 Despite inclement weather brought by Typhoon No. 19, the trainees visited the Lake Toro Eco-Museum Center and the Shibecha Town Local Museum. While there, they observed relics from the Jomon period and handicraft items from Hokkaido’s pioneering days that were discovered in the wetland. The group also asked questions and exchanged opinions on the history of the relationship between the Kushiro Wetland and people, and showed an interest in materials hand-made by museum employees to provide information on the wetland and in illustrations of Red-crowned cranes drawn by children. An exchange meeting was held on October 17 to round off the training in Kushiro with the attendance of KIWC representatives based on their role as part of the teaching staff. 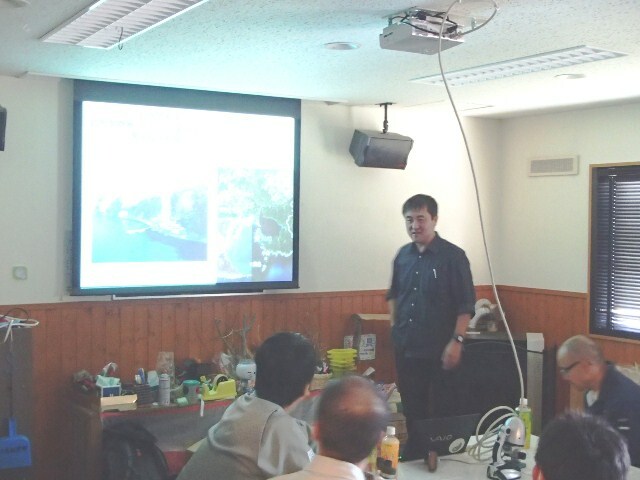 A presentation given at the event by KIWC Technical Committee Chair Mr. Hisashi Shinsho on nature restoration in the Kushiro Wetland was followed by others given by individual groups of trainees on the outcomes of the training. 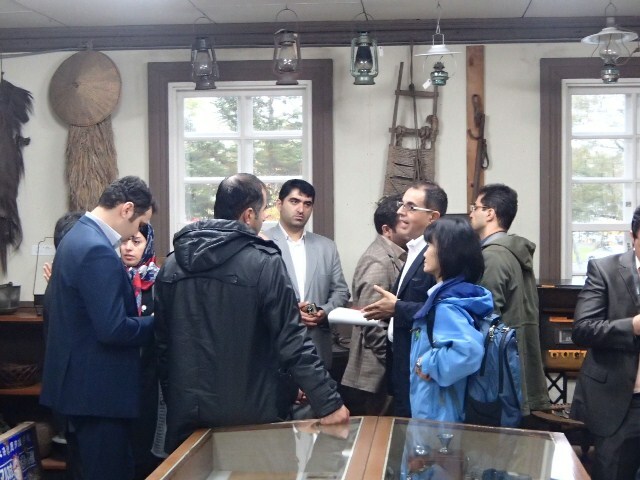 Finally, the KIWC Secretary General wrapped up the party with some general comments, highlighting hopes that the outcomes of the training would be used to help conserve the Anzali Wetland in the future. 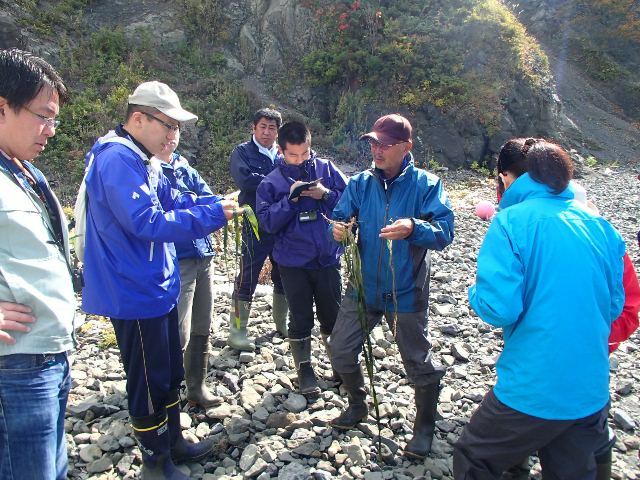 An on-site study meeting on Local Wetlands and Related Benefits (the research theme of the Technical Committee for FY 2013 to 2015) was held in Akkeshi Town on October 10, 2014, for the evaluation of a case example in the Kushiro area. The event was organized with the help of Mr. Tatsuo Shibuya (the Senior Manager of the Akkeshi Waterfowl Observation Center and a Technical Committee member). As part of the meeting, 15 Technical Committee members visited Akkeshi Bay and Lake Akkeshi to inspect seagrass beds and fishing grounds. The Aininkappu coast on the east side of Akkeshi Bay is home to one of Japan’s largest ooamamo seagrass colonies. Mr. Tomonori Isada, an assistant professor at Akkeshi Marine Station (a facility run by Hokkaido University’s Field Science Center for Northern Biosphere) also took the inspection tour and highlighted how ooamamo seagrass provides important habitats for Hokkai shrimp, fish, crustaceans and a variety of other creatures. The next destination, Lake Akkeshi, is a brackish-water lake registered as a Ramsar site, and is known as one of Japan’s most popular stopovers for whooper swans. Oysters and Japanese littleneck clams are cultured in the lake, which supports the local economy. The tour attendees waded into shallow water there to observe small fish, shellfish and a range of other creatures in colonies of amamo and koamamo seagrass. After the on-site inspection tour, the group moved on to the Akkeshi Waterfowl Observation Center, which commands clear views of Lake Akkeshi and the Bekanbeushi Wetland. 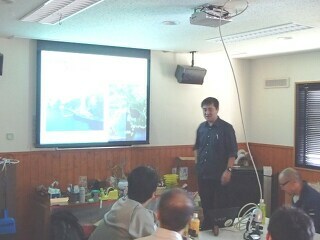 While there, the attendees listened to a presentation by Prof. Masahiro Nakaoka, the Director of Akkeshi Marine Station of Hokkaido University, on the characteristics of amamo seagrass and its important role in the ecosystem. He explained that amamo seagrass beds play a direct role in providing habitats for aquatic life and feed for whooper swans and other waterfowl, and also serve indirectly as part of a complex food web in which fine algae on the surface of seagrass or at the bottom of seagrass beds eventually reach large fish after being consumed by shellfish and animal plankton. He added that amamo seagrass makes a significant contribution to culture fishery through its role in helping to improve and stabilize water quality by absorbing carbon, phosphorus and nitrogen and supplying oxygen. However, it was also pointed out that these seagrass functions are little known to the public and that 5% of the world’s seagrass beds are lost each year. A Technical Committee member highlighted that the ease with which light reaches amamo seagrass through water is significantly related to its growth, and suggested that ooamamo seagrass, which is especially found in deep water, should be used as an indicator of aquatic environmental conditions. Another member pointed out the need to communicate the economic effects and other important influences of amamo seagrass to fishermen and locals as a way of promoting seagrass bed conservation. KIWC ran training sessions on eco-tourism for developing countries in Asia, Central America and Eastern Europe from August 25 to September 30, 2014. Under commission from the JICA Hokkaido International Center (Obihiro), the sessions focused on the sustainable use of local natural and cultural features as tourist resources by local residents in order to boost regional economies and raise local environmental awareness. The training was attended by 10 people from 10 countries, consisting of government administrative officials in tourism promotion and natural park management, NGO staff and others from Bhutan, Georgia, Guyana, Kosovo, Mexico, Mongolia, Myanmar, Suriname, Albania and Turkey. 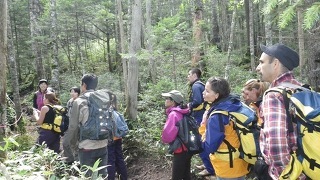 The trainees visited natural parks and wildlife protection areas, including Lake Shikaribetsu (Daisetsuzan National Park), Kushiro-shitsugen (Kushiro Wetland), and Akkeshi-ko and Bekambeushi-shitsugen under the guidance of Course Leader Mr. Hisashi Shinsho (KIWC Technical Committee Chair). They learned about tour operation with due consideration for the environment and wildlife, visitor center utilization and other matters, and also learned about examples of local industry utilization (e.g., stock farming and fishery) in tourism, including experiential tours on horseback, fishing boats and a fishermen’s lodge known as banya. In Tokyo and Kyoto, the trainees experienced tour programs featuring elements of Japanese history and culture, such as traditional art, historic sites and satoyama (community-based forest areas), and were given presentations on the theory and policy of eco-tourism. They also visited Okinawa to learn about a youth job creation initiative based on eco-tourism. The trainees interacted well despite their diverse geographical and cultural backgrounds, collecting and sharing useful ideas for tourism promotion in their own countries and finding time in their busy schedules to explore Japanese cities between sessions.